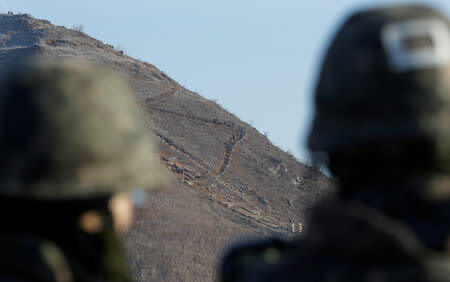 SEOUL (Reuters) - North and South Korean officials inspected work to ease tension on their militarised border on Wednesday, checking on the demolition of bunkers and probing for secret tunnels, despite scant progress on persuading the North to give up nuclear arms. "Our verification team brought stethoscope-like equipment to see if there were underground tunnels, but the North side did not stop them nor express discomfort and actively cooperated," Moon's spokesman, Kim Eui-kyeom, told a news briefing. North Korea's repeated missile tests and its sixth and most powerful nuclear test in September 2017, in defiance of U.N. and U.S. warnings, had stirred fears of war. Kim also met U.S. President Donald Trump for an unprecedented summit in Singapore in June. 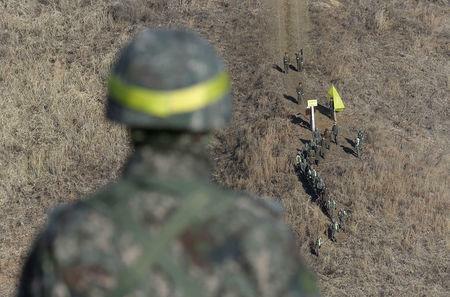 Moon said the removal of the border guard posts and Wednesday's two-way verification exercise marked a "new milestone" in the 65-year division of the peninsula. 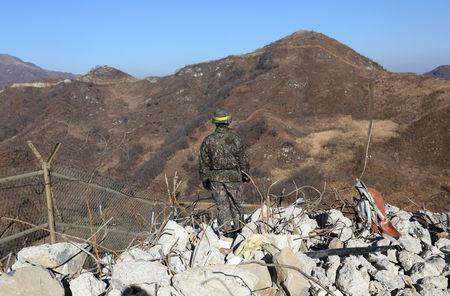 "It's something we couldn't even imagine in the past that the South and the North build trails in the Demilitarised Zone where they confronted each other, and pull out the guard posts and transparently verify it," Moon told aides after watching a broadcast of the inspection. The atmosphere was "cordial" and soldiers chatted and shared cigarettes, Moon's spokesman said.